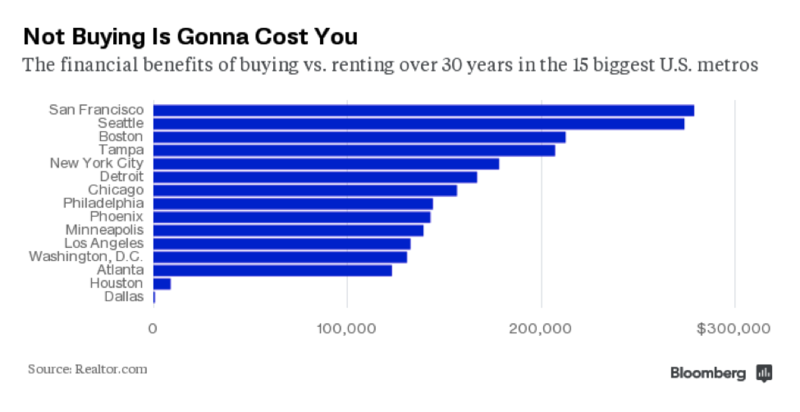 Did You Know That Not Buying a Home Now Could Cost $65,000 a Year? According to a report in Bloomberg Business, “Not Buying a Home Could Cost You $65,000 a Year.” That info comes from a new report showing how renters are missing out on savings in most metropolitan areas. Young professionals who are considering buying a home should take this info to heart (and to their wallets). Having been ranked in the top 1% of the 45,000 worldwide agents of NRT, the parent company of Sotheby’s International Realty, gives me a unique perspective on the market, and I wholeheartedly agree with the findings. The reason? It’s simple: buyers get more for their money than renters. Plus, home prices and interest rates are inevitably going to rise. Just check out the chart above, published by realtor.com, and you’ll see the financial benefits of buying a home based on projected increases in mortgage rates and home prices in local housing markets. This information is based on the amount that buyers gain over a 30-year period in the country’s largest metropolitan areas. In California, the penalties for waiting to buy a home are the greatest. Just consider this: the estimated cost of waiting one year to purchase a home in San Jose was $61,805 and $65,780 in Santa Cruz. That means over the course of a 30-year loan, homeowners will save more than $1 million in Santa Cruz, just 125 miles from Napa Valley. That’s the largest savings amount of any U.S. city. Realtor.com compared median home prices and the cost of renting a three-bedroom home in 382 local markets to compile the report. They also factored in other pertinent information such as estimates for transaction costs and price appreciation. The bottom line: “not buying a home now could cost $65,00 a year” means that now is the time to act. If you are ready to purchase a property in Napa Valley or Sonoma, please contact me at 707-738-4820 or email [email protected]. I am happy to share my insider information on quiet offerings of wineries, vineyards, estates, new construction and homes here, as well as the extraordinary properties that are not available on the open market.